A fracture of the foot or ankle is a risk taken by professional athletes on an almost daily basis, but it can happen to anyone. A broken foot or ankle is a leading cause of a visit to your podiatrist’s office. Stress fractures—One of the most common causes of stress fractures is the continuous pounding on the feet over time that is involved in sports such as football, basketball, and tennis. Bone disorders like osteoporosis can contribute to the severity of a stress fracture. Acute fractures—A sudden fracture may involve a total or partial break of the bone. You will be unable to walk on the foot and there will be considerable swelling, bruising, pain, and possible bleeding. Surgery and resetting will be needed for acute fractures. Compound fractures—This type of fracture may cause a bone to protrude and the skin is broken, increasing the chance of an infection. Stable fractures—When the bones are only slightly out of place, the fracture is easier to treat. Oblique—This fracture is characterized by a diagonal break across the bone. Transverse—A horizontal break defines this type. Comminuted fractures—The bone is shattered into many pieces, requiring extensive reconstruction with screws and hardware. 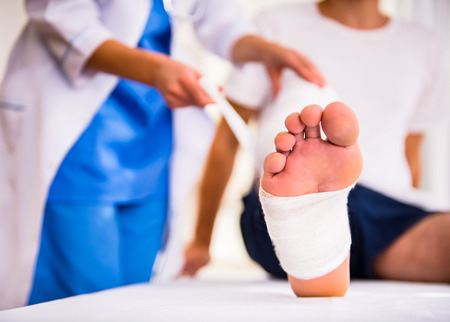 See your foot doctor right away for proper diagnosis and treatment of a fractured foot. The foot specialists at ETL Podiatry in Briarwood and Melville, NY have unparalleled experience in treating all aspects of foot and ankle problems. Our team of doctors is dedicated to serving you with all of the newest diagnostic and treatment technologies. If you have any questions or would like to make an appointment, please feel free to contact one of our offices located in Melville, NY (631)-549-8637 and Briarwood, NY (718)-657-8921.